Step 1 Heat the oven to 350 degrees. Grease a 2-quart casserole (about 10 by 8 inches) and set aside. Step 2 Place a medium heavy-bottom pot over medium heat. Melt the butter, then add the onion and celery and cook until the vegetables begin to soften and color, stirring occasionally, about 5 to 7 minutes. Step 3Stir or whisk in the flour and poultry seasoning, making sure to eliminate any lumps. The roux will pull together. Continue stirring frequently until the roux begins to toast and color, about 3 minutes. Step 4Slowly whisk in the milk and broth, whisking to combine. Once the mixture begins to bubble, turn the heat down and cook for an additional 1 to 2 minutes, stirring frequently. Step 5Add the leftover turkey and vegetables, stirring to combine. Taste, adding more poultry seasoning, salt and pepper if desired. Pour the mixture into the prepared baking dish. Step 6Use a spoon or an ice-cream scoop to alternate small scoops of stuffing and mashed potatoes on top of the vegetable mixture. (Don't worry if the topping sinks slightly into the mixture.) 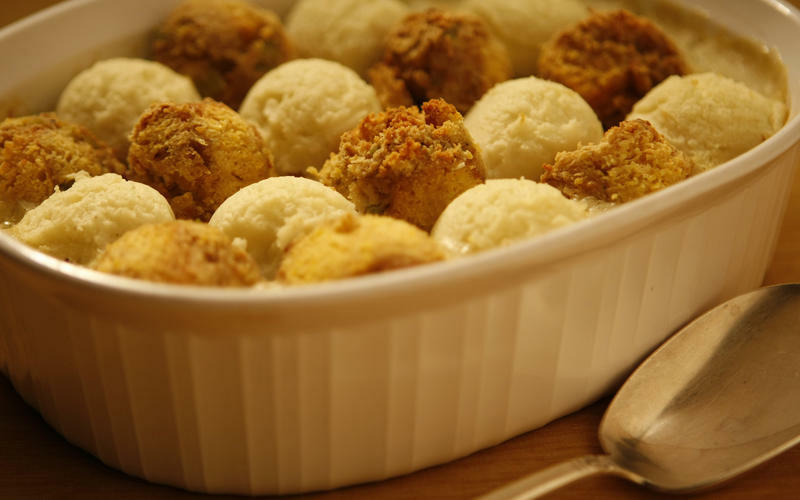 Place the dish in the oven and bake until the vegetable mixture begins bubbling up and the stuffing and mashed potatoes are heated through and just beginning to brown, about 25 to 30 minutes. Step 7Remove from the oven and set aside for several minutes before serving. Serve in a bowl with a scoop of cranberry sauce on the side. In Recipes-list.com we have selected the most viewed recipes from category - Leftovers Main courses Quick and easy . Enjoy the best recipes specially selected for you! Pilgrim's pie is the right choice that will satisfy all your claims.